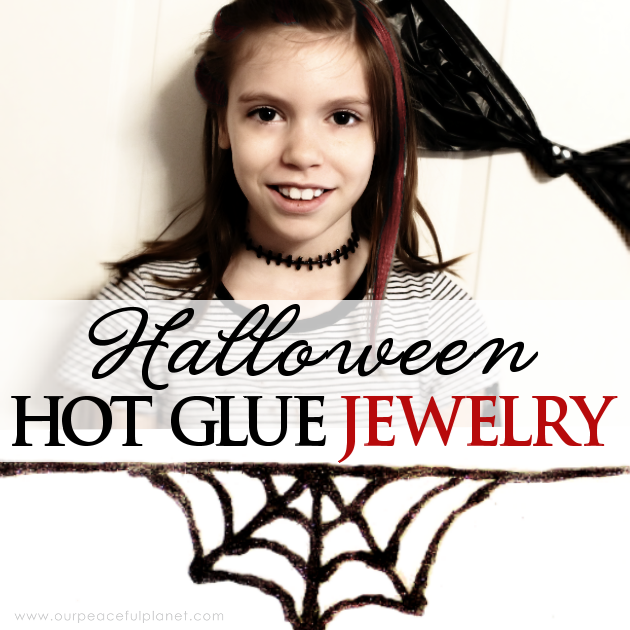 If you’re looking for some quick Halloween costume extra’s or just some Gothic jewelry, you can make these in about 10 minutes with a hot glue gun! They look awesome and kids and adults both can wear them. We’ve got patterns for a variety of styles or you can make up your own. 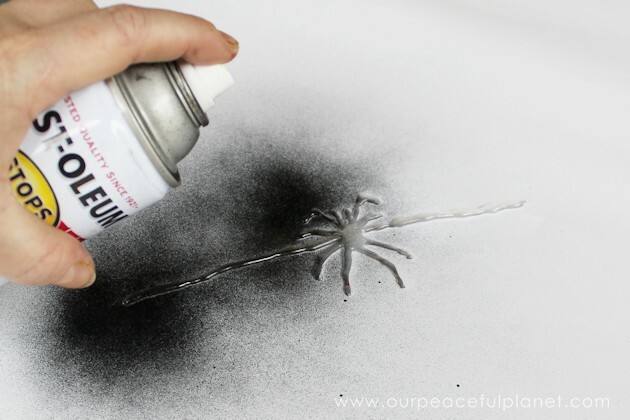 And if you’re looking for more crafts that feature hot glue, check out our Creepy Halloween Decor Black Candles and our Hot Glue Glitter Leaves DIY Fall Decorations! About Teflon Sheets: These things are awesome! You can buy them for cooking, dehydrating and crafting. They are inexpensive and reusable. I have two for crafting and you can work with hot glue, paint and all types of mediums and they clean right off. Excellent for crafters. Some are thicker than others. I used my thin one for this project because you can trace through it. Teflon sheet (This is one I own. It’s a 16″x24″) You could use foil but you can’t trace through it, obviously. 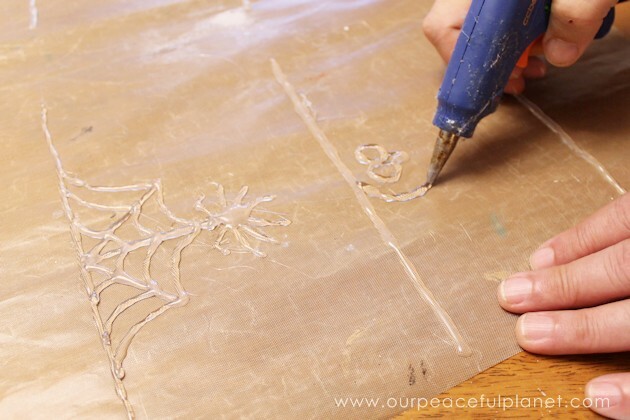 If using a thin Teflon sheet, place your pattern underneath it. 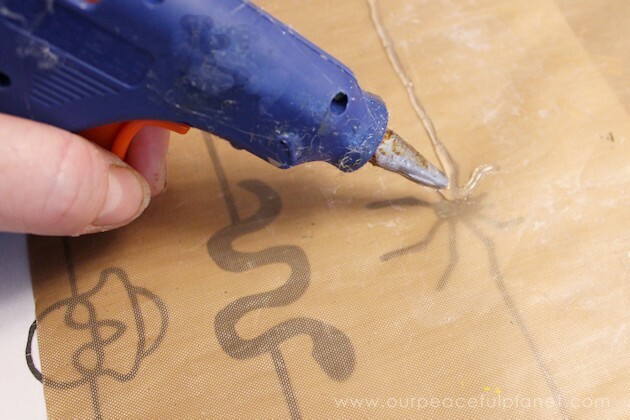 Trace the design with a glue gun making sure the side lines are as long or as short as desired. You can also just draw in with the glue gun using no pattern. Foil will also work if you can draw your own designs without needing to trace. Allow the glue to cool for 3 or 4 minutes, them peel it off. 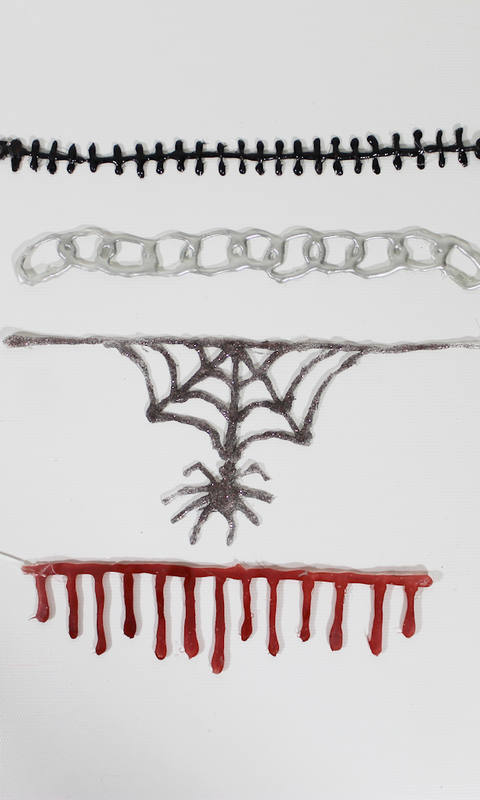 Pull off any small strings of glue that remain. Paint your necklace if desired with acrylic paint and a brush or spray paint. 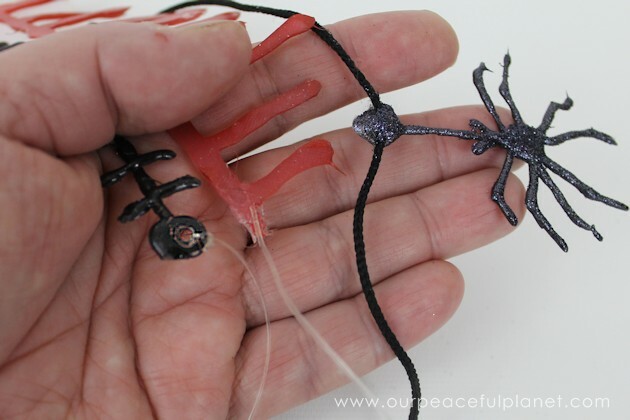 Attach string or cord for tying the necklaces on in a variety of ways. We glued most of ours on. I never could find the Teflon sheets. Is there a place where you can purchase them online? Pingback: How to Install an On/Off Switch to Your Glue Gun in 10 Minutes! really fabulous, thanks for sharing on craft schooling sunday! What a fun idea! My daughter would have fun doing something like this. Visiting from Happiness Is Homemade party. I love crafty ideas that already use things you may have around the house. Could you use waxed paper instead of Teflon sheets? The wax paper would melt from the hot glue but you could use foil as suggested. Most folks have that! What a fun idea! I’m sure my crafty daughter would love this! Next: How to Install an On/Off Switch to Your Glue Gun in 10 Minutes!